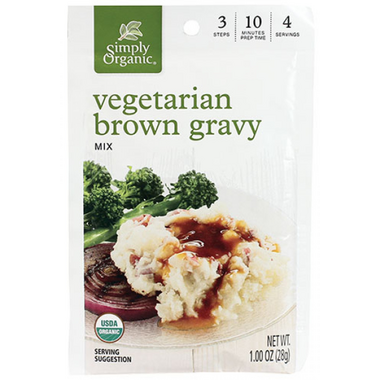 For simple, yet satisfying brown gravy, Simply Organic®'s old-fashioned Brown Gravy Mix is the perfect time saver. With its "from scratch" flavor, this savory mix features the traditional and robust flavors of organic beef stock, onion and mushroom to top your favourite meals. Easy to make and adds taste to any vegetarian dish, especially mashed potatoes. I am so glad I found this gravy! I've been vegetarian for just over a year and I have missed my go to comfort food of mashed potatoes and gravy. I've tried to make my own from scratch a few times but it never really turns out. This mix is super easy to prepare and it tastes really good. This will be going on my order every time I visit Well.ca! My husband and I love this vegetarian gravy. It does taste a lot like a meat gravy. It has lots of flavour and can be used with anything you would use regular gravy with. I am a vegetarian but my husband occasionally eats meat, and this gravy works for both of us. We were quite worried recently when it was out of stock because if it was being discontinued there is nothing else like it. Glad to see its back in stock!